The government has suffered a second Lords defeat in 24 hours over its controversial plans to fine local councils for failing to get elderly patients out of hospital quickly enough. By just one vote, opposition peers managed to win approval on Tuesday for the scheme to be regularly monitored. The vote - 110 to 109 - came amid claims that the new regime could mean patients being discharged to inappropriate care. On Monday peers pushed through a one-year delay to the implementation of the government's Community Care (Delayed Discharges) Bill to April 2004. But a Department of Health spokeswoman said ministers will now seek to overturn the move in the House of Commons. Tuesday's vote will force social services and health bodies to vigorously monitor the impact of the new procedure on patients and carers. It will also require the government to give a yearly update to Parliament on whether the system was working. During committee stage debate on Tuesday, Baroness Noakes, for the Tories, argued that the government had proposed "no external reporting or scrutiny mechanism" to keep the bill under review. But Junior Health Minister Lord Hunt of Kings Heath stressed that the bill's impact would be monitored. Lord Clement-Jones, for the Liberal Democrats, said "almost everybody" but the government were concerned that patients could be forced into inappropriate care. After the defeat, Lib Dem spokeswoman Baroness Barker said: "This amendment ensures that the impact of this bill, which risks turning old people into commodities to be shuttled between hospitals and social services, will be properly evaluated, both by audit and inspection bodies and by Parliament." Under the bill, social services departments will be fined for failing to provide the required home-care or accommodation for patients waiting to be discharged. On Monday, peers voted 153 to 123 to delay the plan to April 2004, rather than introduce it in April this year, as the government had hoped. Ministers will seek to overturn the defeat, but as a compromise they are proposing a further six months of preparations before the scheme is implemented. A Department of Health spokeswoman said: "This issue is too important to be put off for a year. "Elderly people unnecessarily stuck in hospital expect action sooner rather than later." It was important to keep up the momentum in cutting the time people waited in hospital to be discharged, she argued. "To do otherwise will be a disservice to those people currently in an acute hospital bed when they are ready to be discharged to more appropriate care," she added. In the meantime, more than 4,000 elderly people remain in hospitals in England despite being fit to leave. One out of every three will wait for more than a month, according to NHS watchdog the National Audit Office (NAO). NAO head Sir John Bourn said: "This significantly reduces their quality of life and undermines the ability of hospitals to treat more patients and meet testing targets." 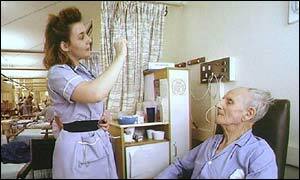 Edward Leigh, Conservative chairman of the Commons Public Accounts Committee, said: "It is intolerable that on any given day 4,000 older people who have finished their treatment are left trapped in hospitals simply because the public services cannot get their act together." The Independent Healthcare Association also criticised local councils, whose "scandalous misuse" of government funding, it said, had caused the current problems. "The government wants this new scheme in place from April"